Aquidneck Pizza used to be one of my favorite summer haunts. An old friend of mine first turned me onto this place and their delicious pizzas, and in turn, I got Mom and my sister on the bandwagon as well. 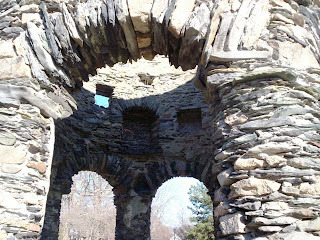 We were all great fans of Aquidneck, even if the place wasn't too pretty to look at. To me, it made dining there more charming. I just adore little hole-in-the-wall places with good food. 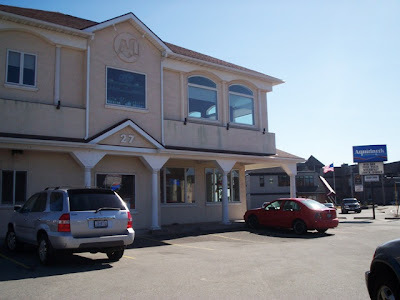 A few years ago, however, the owners of Aquidneck Pizza shut it down and did a complete remodel. They expanded the restaurant (which was hard to do since it sits on a very tiny island between two busy streets), added a second floor, and gave the whole dining room a more "upscale" appearance. Because of this, the cost of the food went up, and the size of the food went down. After returning to Aquidneck after the remodel, Mom and I - although we still loved the food - were a little disappointed with the change. It just seemed that our little pizza dive down by the beach was now "the AQ" - a trendy restaurant with an upstairs bar and plasma TVs. Missing the taste of their delicious pizza, Mom suggested that we visit again. We pulled into the incredibly small parking lot (maybe fitting about 10 cars) at about 3:30 p.m.
A redheaded waitress, who we later found out was named Megan, greeted us as we entered and told us that we could sit anywhere. With a choice between the bar area, two tables, and three booths (the fourth one was taken), Mom and I decided to take the solitary booth situated between two large windows facing Aquidneck Avenue. Megan left two colorful menus at our table and asked us what we would like to drink. After both choosing to have a Diet Coke, Megan quickly returned with the drinks in real glasses. During Megan's absence, I noticed a stack of take-out menus on the counter at the front of the restaurant. I snuck over to grab one for our collection. Since Mom and I had been to Aquidneck before, we pretty much already knew what we were going to order. We chose a large pizza - half extra cheese, half Greek ($13.48), and an order of steak fries ($2.99). After Megan left to give the chef our order, she soon returned to bring us two large plates for our fries/pizza. Waiting for our meal gave us plenty of time to notice all the differences between the new and the old Aquidneck Pizza. 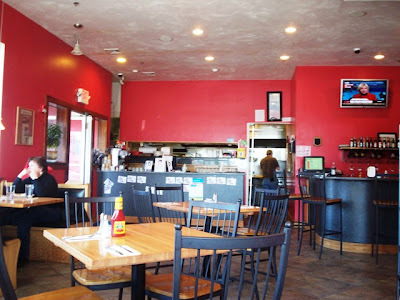 The old Aquidneck Pizza had a variety of booths lining three sides of the dining area. Although the vinyl on some of the booths was starting to tear, the seats were quite cushy and comfortable. There was also quite a few tables in the center of the room that were accompanied by old-fashioned chairs. There was a rug, a tiny television which sat on top of a cooler, and a lack of interior lighting which, in my opinion, made it very cozy. The new Aquidneck Pizza is quite different, and although it's not the old dive I fell in love with, it is very pretty inside. The walls are painted a bright red, while the floor is blanketed with a heavy stone tile. The pale wooden booths are very comfy, the tables are accompanied by black chairs, and the white mini blinds - which were open today - allowed the sun to pour in and customers to look out onto one of the busiest areas in Newport/Middletown. Although the variety of dead plants on the windowsill was quite disturbing, the skinny hanging lights above each booth were quite attractive. Music played softly in the background, lighted beer signs hung in some of the windows, and a large flat-screen TV hung above the trendy, black bar area. A shelf that held a variety of gourmet chips sat in the corner next to a large set of stairs which leads to the upper level, which I've never seen. From what I've noticed when I've driven by at night, I'm guessing the upstairs is used for parties. We even overheard Megan telling another customer about a Confirmation party scheduled upstairs the very next day. Megan brought over our fries first, accompanied by a bottle of ketchup. The fries here have always been crispy and delicious, and although Mom was able to shove a few in her mouth, they were just too hot for me. I had to cool them down with some ketchup, but they were excellent. Apparently, the fries were so hot that I chugged down my Diet Coke. Megan noticed this, grabbed my glass, and gave me a free refill. While we were still drooling over the yummy fries, our pizza arrived. Mom's half was topped with extra cheese, and she told me that although she hadn't had Aquidneck Pizza in a long time, the taste of the pizza reminded her of why she enjoyed coming here. She had forgotten how good the pizza was, and this one was no different. Although the pizza seemed smaller than it used to, fortunately the taste hasn't changed. The crust is very light with a nice, crispy edge with almost a pastry-like texture. It is delicious. The sauce is very fresh, more sweet than bitter, and you can tell the chef uses real cheese instead of the fake stuff (i.e., Domino's). The pizza always arrives piping hot, which is a plus for both myself and Mom. My side was covered with Greek toppings - feta cheese, onions, and spinach. 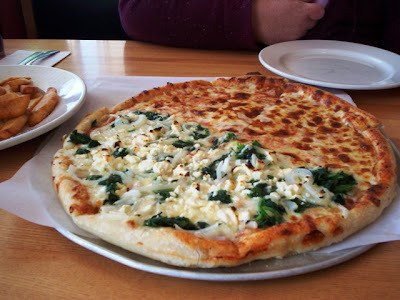 The greens were extremely fresh, the feta was tangy, and I've always said that Aquidneck's Greek pizza was one of - if not the best - Greek pizzas I have ever tasted. Now that we've reacquainted ourselves with Aquidneck Pizza, we cannot wait to go back. You can get pretty much anything you want at Aquidneck Pizza. With a Greek influence, everything we've ever had here has been excellent. Appetizers include buffalo chicken wings ($6.99), potato skins w/various toppings ($6.99), and calamari ($6.99) served with hot peppers and marinara sauce. Soups and salads include the soup of the day (cup - $2.49; bowl - $3.99), chili with mozzarella (cup - $2.99; bowl - $4.49), antipasto ($7.99), and Greek salad ($7.99). You can top any salad with grilled chicken breast or homemade tuna salad for an additional $2. All sandwiches come with lettuce, tomatoes, and your choice of cheese. They are served on your choice of a roll or wrap. Varieties include the Italian ($6.49-7.49), tuna ($5.99-6.99), pastrami ($5.99-6.99), sausage Parmesan ($5.99-6.99), and a gyro on pita bread ($6.99). Burgers include the hamburger ($5.49), mushroom burger with cheese ($6.99), and the Aquidneck Burger ($7.99), which comes topped with bacon, onions, cheese, and BBQ sauce. Club sandwiches include the turkey ($7.99), cheeseburger ($8.49), and BLT ($6.49). If you're looking for something a little heartier, you can order a plate of pasta. All pasta is served with garlic bread and a tossed salad. Choices include the pasta with garlic and oil ($6.99), shrimp scampi ($12.99), lasagna ($10.99), ravioli (cheese or meat - $9.99), and stuffed shells ($9.99). There is also a list of Aquidneck specialities like the baked stuffed eggplant ($11.99) and the teriyaki sirloin ($15.99). Aquidneck also has a list of desserts, and a long list of their speciality pizzas such as the veggie ($10.49-14.99), Hawaiian ($8.49-11.99), the "no cheese please" ($9.49-13.49), and the chicken Florentine ($9.49-13.49). The great thing about Aquidneck is that they also serve breakfast! You can get anything from eggs ($3.29-7.99) and omelets ($5.99-7.29) to breakfast sandwiches ($2.99-4.99) and pancakes ($4.99-5.99). I left $25 on the table for Megan, which included a 20% tip. She was a great waitress. Before we left, Mom and I decided to check out the restroom to see how different it was. This was one change that we both LOVED. This bathroom was out of this world! It had the same black slate color scheme as the bar and the floor, automatic hand blowers, and a button that a handicapped person could use to open the door. What a state-of-the-art facility! It was so large and roomy; I didn't want to leave! Mom felt the same way, but before she went in I warned her to be careful which door she chose. The wooden "M" and the "W" on the wooden doors were a little difficult to see. With our extra pizza slices and fries in hand, Mom and I headed back to my car. Although the look of the place may be different, the taste of the food brings us back to the Aquidneck Pizza we first fell in love with. I've since gotten rid of the friend who turned me onto this place, but I could never see myself breaking up with this pizza. It's too fantastic. Aquidneck Restaurant & Pizzeria is open from 7 a.m. to 10 p.m. Sunday through Thursday, and 7 a.m. to 3 a.m. Friday and Saturday. 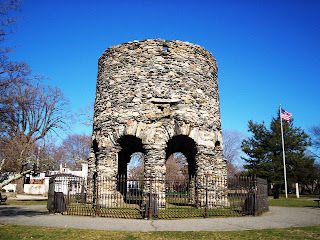 RANDOM HISTORY LESSON: In my new favorite book, Weird New England by Joseph A. Citro, there was a page devoted to an ancient structure that stands in Truro Park, Newport, RI. 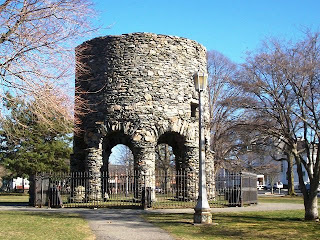 After coming from Aquidneck Pizza, which is in the neighboring town, we decided to drive by and take a closer look at this mysterious landmark. The book describes it as a "maybe" windmill, a.k.a., no one has any idea as to what it really is. 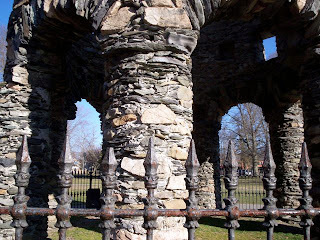 Apparently it was standing when the pilgrims first arrived, and even appears on a map of Rhode Island dated 1630. What do you think it is? Mom and I think it could have been an ancient watchtower. Cool, huh?